2014 Ford Transit Connect Pros and Cons: Why (Not) This Car? For their first dozen years, minivans were truly mini. But in the latter half of the 1990s they grew to become among the largest vehicles primarily bought for family use. Four-cylinder engines, once the only option, have given way almost entirely to thirstier V6s. Has this shift opened up space for a family van with specs similar to those of the original minivans? Or is there little reason for such a vehicle in North America? 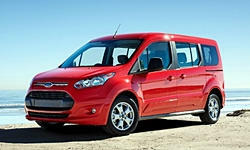 Europeans can choose from a fairly broad selection of three-row compact vans (which they generally label MPVs). In recent years Americans have had one option: the Mazda5. (Canadians have retained a second, the Kia Rondo.) But the Mazda5 was not available here with a three-seat second row, so it could not carry a five-person family plus their luggage, at least not without a rooftop carrier. For this and other reasons it hasn't sold well, and after 2015 it will no longer be imported. Ford offers three options in Europe. The Grand C-MAX, a little smaller than the Mazda5, was nearly imported a few years ago, but at the last minute Ford decided it wasn't viable and pulled the plug. The larger, sportier S-MAX supposedly was going to be offered here once it was redesigned, per CEO Alan Mulally's "One Ford" strategy. It has now been redesigned, yet doesn't appear to be crossing the Atlantic. The third we've been getting since 2010. Unlike the Grand C-MAX and the S-MAX, the Transit Connect was designed primarily for commercial cargo. Few families would consider a vehicle with its upright, boxy styling and sparse, crudely furnished interior. With a redesign for 2014, though, Ford thoroughly revised the exterior and upgraded the interior to make the Transit Connect more family friendly. Did Ford do enough? Why might someone buy a made-in-Spain Transit Connect instead of, say, a Toyota Sienna? The Transit Connect's interior styling is much like that of the related Focus, C-MAX, and Escape. Why the 2014 Ford Transit Connect? The #1 reason to consider a Ford Transit Connect as a family vehicle is the reason I've been looking forward to testing one: it handles much like a compact car, just one with some (objectively more than some) additional length and height. There's little understeer to speak of. Due some credit: Ford has augmented the inherent capability of the chassis with brake-based torque vectoring. A conventional minivan such as the Toyota Sienna doesn't feel nearly as agile and plows more when hustled through a turn. In additional to this agility, the Transit Connect handles with impressive composure. Even on the worst roads it feels reassuringly solid and planted, taking even mid-curve bumps and potholes in stride. The Ford also leans surprisingly little given its 72-inch height (about four inches more than a conventional minivan, and over a foot taller than the typical compact car). Keep pushing, and you'll trigger electronic controls before the chassis reaches its actual limits. These are somewhat obtrusive, but then the Transit Connect isn't a sports car. I felt somewhat silly driving a van hard enough to provoke them (this silliness being some of its charm). The Transit Connect's steering initially felt overly light and quick, if well-weighted. I adjusted. Still, the Mazda5's steering feels more natural and provides much more nuanced feedback. The Ford doesn't provide as direct a connection with the front tires' contact patches. The Mazda also feels even more agile, as it should since it is far smaller (nine inches less length, three inches less width, eight inches less height, 500 lbs. less weight). While the Ford is fun to drive given what it is, the Mazda is simply fun. Alas, the Mazda5 has been discontinued. There won't be a 2016 here. Even if it currently reigns as the best-handling three-row vehicle Americans can buy, it won't for much longer. I keep alluding to the Transit Connect's dimensions. I tested the long wheelbase version. The regular wheelbase Transit Connect, with 16 inches less length, is closer in size to the Mazda, but is not available with a third row. The wheelbase of the long version, 120.6 inches, is over an inch longer than that of the Sienna. This helps explain the Ford's composure. The Toyota has longer overhangs, though, so it is over ten inches more lengthy overall (200.2 vs. 189.7). A vehicle's width has more impact than its length on perceived agility. At 72.2 inches from door panel to door panel, the Transit connect is three inches wider than the Mazda5 (and the original Chrysler minivans) but a half-foot narrower than the Sienna. This is why it feels compact and agile despite its ten-foot wheelbase and six-foot height. The Transit Connect's windows are HUGE. They start lower and extend higher than those in a conventional minivan. How high is the ceiling? While seated I could barely reach it. The windshield is also far away. Very little seems to come between you and the outside world. This configuration does cause a couple of problems. First, while the sun visors are large they're sometimes still not large enough. Second, Ford has fitted the Transit Connect with a standard rearview mirror. No matter how you adjust this mirror you cannot see out the entire rear window. This isn't necessary--you can still see at least as much out the back as you can in any other vehicle with a standard-sized rearview mirror. But it seems odd. I kept adjusting the mirror up a bit, then down a bit, hoping to find an ideal position. I never did. These adjustments are themselves a hassle. Because the windshield is far away it's not possible to adjust the mirror without leaning well forward, at which point you're guessing what you'll see in the mirror once you lean back into the seat. The Transit Connect's side view mirrors are large, and include wide-angle spotter mirrors. You'll have no trouble seeing what's around this van. This said, a blind sport warning system would be nice to have, but is not offered. Why did they cut the lower corners of the side windows, then black out the frames to conceal them? Physical knobs and buttons are well-designed, but nav option includes the MyFord Touch interface. Why is the Transit Connect so tall? Mostly to fit more commercial cargo. But Ford has taken advantage of the van's height by fitting a storage shelf over the first row and offering overhead storage compartments just ahead of the second row as an inexpensive option. Both seem quite neat...but it's not clear how useful either might be. The shelves up front are open, so you shouldn't stow anything up there that would hurt if it fell on your head. The second-row compartments could hold a few eletronic devices, books, and so on. But they're flimy, which perhaps should be expected given their $95 price. Sturdier overhead compartments would be better even if twice the price. The glove compartment and door map pockets are both roomy. With less size and weight and a smaller engine, the Ford Transit Connect does get better fuel economy than a conventional minivan...but its advantage isn't large. The Ford's EPA ratings--20 mpg city, 28 mpg highway--best the Toyota Sienna's by two in the city and three on the highway. But the Honda Odyssey is rated 19/28. On the other hand, the much smaller, much lighter Mazda5 only managed 21/28. What's going on? Well, the Ford is very tall, so even though it's narrower it's pushing nearly as much frontal area through the air. This especially matters on the highway. Also, the Transit Connect is not much lighter, 3,979 lbs. to the Sienna's 4,310. Two tons is a lot of weight for a 2.5-liter four-cylinder to motivate. In the real-world, a light foot in the suburbs could nudge the trip computer average to 27 (even 30 on one trip). The Odyssey's trip computer reported numbers about five below these, while the Sienna struggled to crack 20. Push the Transit Connect a bit harder, and the trip computer average dropped to about 23, still good for a vehicle its size. But was the trip computer accurate? The gas gauge needle fell much faster than these numbers suggested it should have. On a 70-mph highway, even the trip computer numbers were short of the EPA rating, about 25. The big minivans can do this well. Blame the Ford's frontal area. The Transit Connect's fuel economy advantage is chiefly in urban and suburban driving. Why Not the 2014 Ford Transit Connect? The list of features available on the Toyota Sienna but not available on the Ford Transit Connect would fill much of this box. The items most likely to be missed: power sliding doors and a power liftgate. Americans have grown used to having these on minivans, but you cannot get them on the Transit Connect. Nor could you on the Mazda5, but the Mazda's sliding doors are easier to open and close. You'll also have to remove the key from your pocket to unlock and start the van. Once into the second row, you'll find that it doesn't recline. Nor can you get an entertainment system. Or sun shades on the side windows. On the safety front, you can get a rearview camera and front and rear obstacle detection, but not blind spot warning, lane departure warning, or foward collision warning. You can get heated leather seats, and these were on the tested van. Especially at highway speeds much more tire and road noise intrudes into the Ford Transit Connect's cabin than into the Toyota Sienna's. It's not downright loud inside, but on long highway drives the low-level humming and thumping could prove tiresome. I often had to adjust the audio system volume to compensate for changing levels of ambient noise. This said, while you could certainly hear the tires impacting bumps and chuckholes, you couldn't much feel these impacts. Especially in long wheelbase form the Transit Connect rides very well. Nose similar to other compact Fords, but followed by a much taller body. Huge windshield. Roomy, comfortable second-row seat can hold three people. But it doesn't tip forward or recline. As mentioned when discussing fuel economy, the Transit Connect's 2.5-liter four-cylinder engine doesn't have things easy. Its 169 horsepower are just adequate for accelerating a two-ton vehicle. While I didn't have an issue with this personally--the Transit Connect was generally as quick as I needed it to be--anyone expecting the relatively effortless thrust of the Sienna's 266-horsepower 3.5-liter V6 engine will be disappointed. Compounding the issue, if and when you do need to exercise the Ford's four it sounds strained. Ford offers a 178-horsepower turbocharged 1.6-liter four-cylinder engine as a $795 option with the regular wheelbase Transit Connect. For some reason, though, this engine isn't offered in the long wheelbase van. Beyond a slight bump in power output, the smaller but boosted engine is worth a couple more mpg in the EPA's tests. Much better for performance would be the turbocharged 2.0-liter engine offered in the related Ford Escape and Ford Focus. If Ford is serious about marketing the Transit Connect as a family vehicle, it should offer this engine. The Transit Connect's second-row bench is roomy and fairly comfortable for two people, but somewhat tight for three. The Sienna has another half-foot of shoulder room. Also, the seatback in the Ford's second row does not recline. If you do want captain's chairs, well, they're not an option. The situation worsens in the Ford's third row, which is less substantial and much lower to the floor than the third-row seats in the Honda or the Toyota. Unlike the Transit Connect's second row, its third-row seat does slide fore-aft (about six inches) and recline. Slide it all the way back, and legroom becomes almost generous. Still, it isn't a place many adults would want to spend much time. On top of this, it should be easier to open and close the Transit Connect's sliding doors and to get into its third row. The second row doesn't tip or slide forward like those in conventional minivans. Instead, it must be pushed to the floor in a fairly difficult two-step procedure. The Transit Connect's physical controls are well-designed and easy to reach. But vans with navigation have the much-criticized MyFord Touch infotainment interface. My chief issue with this interface: the buttons on its touchscreen are often too small and located too close together, making it hard to find and tap the one you want while driving. At least the screen is easier to reach in the Transit Connect than in some other Fords. Transit Connects sans nav have a vast field of physical buttons beneath a smaller, non-touch display. These controls might be intelligible to Europeans, but they pose a challenge for North Americans. With a low pointy nose appended to a tall, boxy body, the new Transit Connect looks little like conventional minivans. This design conceals the body's unusual height far better than that of the previous Transit Connect did. Especially in long wheelbase form the new Transit Connect appears far sleeker and more appropropriate for family transport. One questionable element: a large amount of black-out trim around the side windows. Why cut the lower corners and then seek to conceal the actual window shape? Overall the new Transit Connect's styling works for me, especially in the tested blue, but opinions vary. Yours? Hard plastic covers nearly every interior surface of the Transit Connect save the one you're sitting on. Aside from the optional overhead storage bins, this hard plastic seems sturdy. Still, conventional minivans can look and feel much more luxurious. The Ford Transit Connect's seats do one thing well: they fold to form a low, flat floor despite the lack of Chrysler-like storage wells. You can fit more cargo into a Transit Connect than you can into a Sienna without removing its bulky, hefty second-row seats. Want deets? While the cargo floor is 94 inches long in the Sienna with the second-row seats removed, it is only 70.5 inches long with these seats tipped against the front seats. Fold both rows in the Transit Connect and its cargo floor is 83 inches long. (Want to also fold the front seat? Then don't get leather.) Cargo area width is 47 inches in the Ford and 52 in the Toyota. Cargo area height is 39 inches and 40 inches, respectively. How can the Toyota hold slightly taller cargo despite its roof being three inches lower? Its third row stows in a deep well rather than on top of the floorpan. 1. Fold the second row backrests (two sides). 2. Push the second row seats down a few inches so they're flat on the floor. 3. Flip the third row cushions over and forward, so they're upside down and flat on the floor. 4. Move to the rear of the van and lower the third row headrests. 5. Fold the third-row seatbacks forward. 6. The folded seat sections have large gaps between them. To cover these gaps and create a continuous flat floor, unfold the thin, load-bearing covers attached to the backs of the third-row seats. The first unfolding covers the upside-down third-row seat bottoms. The second unfolding covers the gaps between these and the second-row seats. Especially regrettable: before folding the third row, it is first necessary to fold the second row. Want to only fold the third row? Then you must still first fold the second row, then fold the third row, then put the second row back up. In conventional minivans the third row can be entirely folded by reaching through the tailgate. There might be an inherent tradeoff between the simplicity of the process and the utility of the end result. Do you want the lowest floor and the most volume, or the easiest-to-fold seats? Need to carry both people and cargo? The long wheelbase Transit Connect has much more space behind its third-row than the Mazda5 or most crossovers, but less than conventional minivans. The official spec is 19.8 cubic feet. But the third-row seats have six inches of travel, so the length of the cargo floor behind them ranges from 15 to 21 inches. Ford might have measured the cargo volume spec with the seats all the way forward, at which point the average adult's knees will be pressed against the backs of the second-row seats. The Ford Transit Connect is much smaller than a Toyota Sienna, and its engine is down two cylinders and a liter of displacement, so it must be much less expensive, right? Well, yes and no. A 2015 Ford Transit Connect Titanium (the highest of three trim levels) with navigation and 17-inch wheels lists for $31,440. A Toyota Sienna XLE (the second-highest of four trim levels) with nav lists for $36,760, over $5,000 more. But the Toyota has about $4,000 in additional features that aren't even available on the Ford. Adjust for these, and the Ford's value advantage is only about $1,250. Don't need heated leather seats or automatic climate control? Just want a basic van? The Transit Connect XL lists for $26,180, about $3,300 less than the $29,485 Sienna L. But the Toyota's additional standard content accounts for all but $1,000 of this difference. The Mazda5, now at the end of its run, has been about $6,000 less expensive, but still hasn't sold well. Also bear in mind that the Toyota Sienna isn't the least expensive conventional minivan. Even before discounts and incentives, which tend to be generous, the Dodge Grand Caravan R/T only lists for about $1,000 more than a Transit Connect Titanium with nav and 17s. Adjust for the Dodge's additional content and it checks in $2,800 lower than the Ford. And if you want a no-frills van, the $22,190 Grand Caravan AVP lists for nearly $4,000 less than a Transit Connect XL. The bargain-priced Dodge likely deserves much of the credit / blame for the lack of compact van options in North America. I like the idea of an agile, compact van, and enjoyed driving the Transit Connect. The Ford is nearly as fun to drive as a Mazda5, while being much more capable of carrying three rows of passengers and their stuff. In terms of interior space, it's a much more viable alternative to a conventional minivan like the Toyota Sienna. But, as much as I'd like to see compact vans succeed in North America, it's hard to see the Transit Connect winning over many families. The 2014 redesign helped a lot, but still not enough. The second-generation van still lacks the power, ease of use, and amenities of conventional minivans. A low price would help compensate, but the Transit Connect's price is well above the Mazda5's and uncomfortably close to the Toyota Sienna's when feature differences are accounted for. As is, only families that place a high priority on agile handling, a compact footprint, or in-town fuel economy are likely to buy one. Then again, a surprisingly large number of minivans are bought by people without children. (At one point these sales were about a third of the total.) For these people, who also bought more than their share of Pontiac Azteks and Honda Elements, utlity is the big draw and amenities are a lower priority. The new Ford Transit Connect could be exactly what this group is looking for. A 2.5-liter four-cylinder engine is barely adequate for a two-ton vehicle. With both rows folded the cargo area is 83 by 47 by 39 inches. Ford and Toyota each provided an insured vehicle for a week with a tank of gas. Earlier, Frank Cianciolo of Avis Ford in Southfield, MI, helpfully provided a test drive of a short wheelbase Transit Connect. Frank can be reached at 248-226-2555. 2014 Ford Transit Connect pros and cons, according to Michael Karesh: the best reasons for buying (or not buying) the 2014 Ford Transit Connect. Join TrueDelta to post your own impressions. The reason this type van based people mover (such as the Citroen Berlingo Multispace) is popular in europe is because they are consideralilbe cheaper than minivans like the Ford Grand C-max or Mazda 5. If the base price was closer closer to $18K with a reasonable optioned model for under $20 then they may have sold a few but at this current price you'd be crazy to buy one over other minivans Prehaps they'd make a good used by in 3 years where they'd probably sell for under $12k. I learned on a European forum for the Transit Connect that the Ford is considerably more expensive than French competitors, so the latter outsell it quite a bit, at least in the UK. I went through this process in June of last year. Our decision came down to the Transit Connect Wagon XLT LWB and the Sienna LE. We got the Sienna. For the most part, I'd agree with what you wrote (as usual). My experience: Theoretically, the Transit Connect wagon was better than it was in reality. We'd have had to wait to order one because it was between production times and the cool features we wanted were not on the lots. The lots had plenty of expensive options that I didn't care about. The Transit was awesomely configurable, but only in theory. Based on what we could buy, it was worse in most ways. Though it was cheaper on the sticker, it was actually about the same cost to drive off the lot. Ford had $750 on the hood and little willingness to negotiate. Toyota had $1500 and 0% 5 year AND because all 10 dealers around me had a silver LE on the lot, they were thousands of dollars more willing to negotiate. -Interior storage: Neater in format with some of the Transit options, but better overall in the bigger Sienna. It was good in both though. -Fuel economy was not nearly as different as it should have been. I saw it as a wash. You nailed it the powertrain section...Ford's base offering was mediocre. Toyota was a big winner there. -An issue you didn't review: The Sienna looks ok to maintain. I like working on Toyotas. They are designed to be maintained well. The Mazda-derived Transit Connect 2L was NOT. A simple oil filter change looked like a labor of hatred. The Sienna practically changes itself. -I love the exterior style/size of the Transit Connect. I loved the options. I like the availability of stupid steel wheels (function over style, sorry). Too bad these did not overwhelm common sense and dollars. I know which one will last longer and give our family a better time on trips. I know which one will have the best availability of parts and aftermarket add-ons (trailer hitch/wiring for under $200, perfectly-matched side impact guards were $90)--it's hard to get more ubiquitous of a ride than a silver Sienna LE and there are a lot of advantages to it. It has also delighted us on long and short trips and when we have needed to haul things. In short, I wanted to love the Ford, but I came to the same harsh realities you noted...it just didn't offer the slam-dunk long-term value that the Sienna does. Being used to more Euro flavored cars, the overall driving experience is much to our liking, even if it's not a hotrod with the standard engine. My wife especially likes the smaller footprint of this vehicle--she hated the bloat of the larger minivans and despises SUVs. We will be using this vehicle on long trips too, and we routinely have to drive around in big cities such as NY, Boston, Philly and DC. Having something that's easier to maneuver around those streets will make driving there much more tolerable. And we are frankly not enamored of all the bells and whistles that come with the $35-40k Odyssienacaravans, so getting what for us is a substantial break in cost and a simplification in features meets our current needs just fine. I thought I was BTDT with the minivan stage of our lives, and we are fully aware that this one has cargo van roots to it. But I'm glad that this vehicle came just in time for our present circumstances, and with just enough refinement that works for us.